King Tailgater Controls VQ4550 - With a DISH subscription, enjoy HDTV wherever you are. By buying this product you'll earn up to 450 Rewards points. 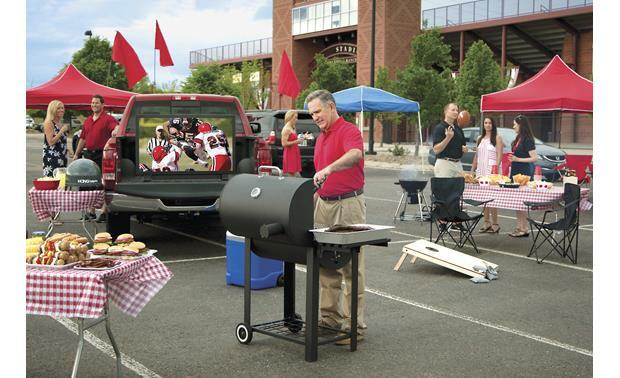 I love a good tailgate, but there always comes the time when you can't bear to miss a minute more of the game, no matter how much fun the party is. 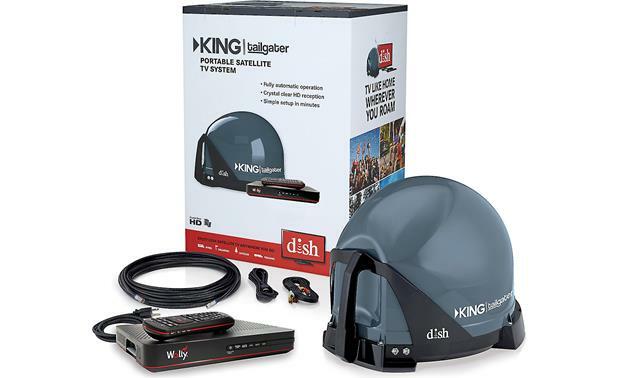 King's Tailgater VQ4550 portable antenna and compact Wally™ receiver extends the good times by giving you access to your DISH® HDTV subscription wherever you are. Fried chicken and ham biscuits bring the crowd to your prime space, but this bundle keeps folks there by letting them watch the game. If you're a DISH HDTV subscriber, this antenna/receiver pairing will allow you to watch satellite cable in perfect HD anywhere you have power. Place the Tailgater roof-mountable antenna where you have the clearest view of the Southern sky, connect it to the DISH receiver, and follow the prompts that appear on your TV (not included) to capture the best possible satellite signal. Once calibrated, you'll be able to enjoy all your favorite programming with a cool, koozied beverage in your hand. DISH's pay-as-you-go plan only bills you for the months you use. There's no contract, and you cancel satellite service at any time, without penalty. And if you already have DISH at home, just add the new receiver to your account for one bill. Call DISH to see if local channels are available in your area. Tailgater Portable Satellite TV System: The Tailgater Portable Satellite TV System (VQ4550) consists of a fully-automatic, portable satellite antenna and a DISH Wally HD satellite receiver. It's easy to set up and automatically finds the right satellite for your DISH signal. Portable and lightweight, it's easy to carry from one outdoor activity to the next. Note: The Tailgater Portable Satellite TV System (VQ4550) only works in the 48 contiguous United States. Portable Satellite Antenna: The KING Tailgater is a receiver-controlled automatic portable satellite antenna. The KING Tailgater offers automatic satellite acquisition wherever you go with no separate remote control or power source required. DISH's satellite technology allows you to watch HD programming while the vehicle is moving using this auto-tracking antenna. The fully automatic portable HD satellite antenna sits on the ground or permanently mounts to the roof of your RV. Full Automatic: Your satellite TV programming is delivered from up to 3 satellites located at the 110°, 119°, and 129° west longitudes. 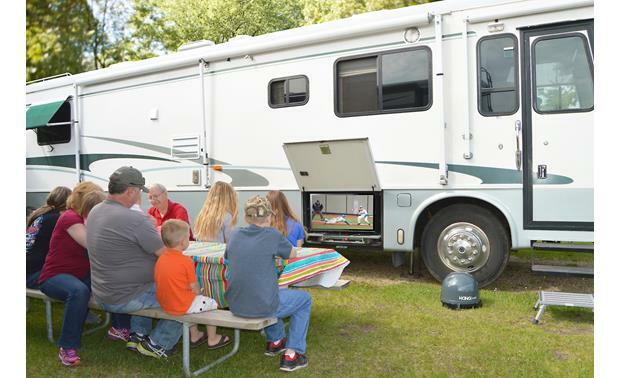 The KING Tailgater will automatically find and then switch between satellites as you change channels to offer you the ideal viewing experience. Dual Coax Outputs: The portable satellite antenna feature two coax outputs, so you can connect up to two Dish Wally satellite receivers for multiple TV viewing. Second receiver sold separately. Programming must be on the same satellite. Security: The KING Tailgater antenna features an integrated security bracket that can be secured to an object using a padlock and cable (not included) to deter theft. Placement: The KING Tailgater requires an unobstructed view of the southern sky for the best signal reception. Be sure to place the portable antenna in a location free from obstructions such as people, trees, buildings, vehicles, etc. This will allow for the strongest signal and will help prevent any interruption to your programming. Point the handle approximately north to speed up search time. Heavy rain, snow, or dense cloud cover can reduce the satellite signal, which may interrupt your programming. Your programming should return as conditions improve. Note: The KING Tailgater portable satellite antenna measures 18.75" (w) x 13.5" (h) x 17" (d). DISH Wally Satellite Receiver: The Tailgater Portable Satellite TV System (VQ4550) comes with DISH Wally HD satellite receiver for receiving high definition and standard definition programming from DISH. 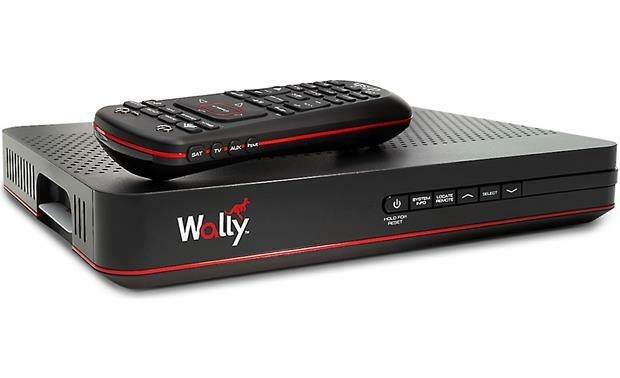 The DISH Wally is a high-definition (HD), single-tuner satellite receiver that is perfect for mobile use. Its compact design is perfect for applications where there is limited space (like in an RV). It supports one TV in high-definition (HD) or standard-definition (SD). The DISH receiver provides HDMI and Composite Video/RCA Outputs to your TV. There are also two rear-panel USB ports and an Ethernet RJ-45 jack. Audio Codes: PCM and Dolby Digital 5.1ch surround sound. Note: The DISH Wally satellite receiver measures 10.4375" (w) x 1.5625" (h) x 9.125" (d). DISH Programming: Using the Tailgater Portable Satellite TV System, you can view most any DISH or DishLATINO programming packages. Some channels, including international programming, RTN, local channels and Regional Sports Network(s) are subject to availability based on your geographical location. You can then add this antenna and receiver package to your existing account for just $7/month, and you can turn on or off this fee on a monthly basis as your travels require. If you are not already a DISH subscriber, you can sign up for Pay-As-You-Go TV programming (starting at $34.99/month). 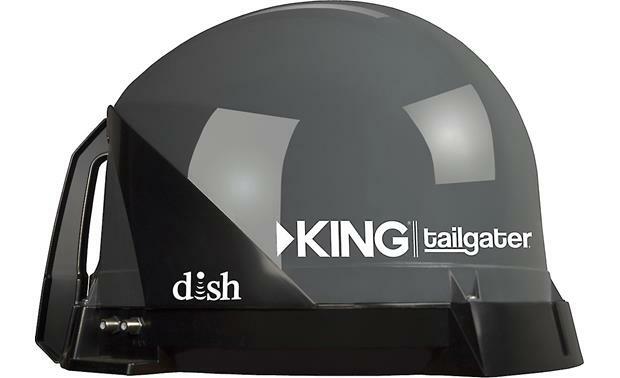 First-time use of your KING Tailgater should be at your residence or a location where you have good phone reception, as you will need to call a DISH mobile antenna specialist at 1-800-963-DISH (3474) to activate the receiver and begin viewing satellite programming. The DISH Wally receiver requires the USB OTA Tuner (Part # 73913, sold separately by DISH) for local channels. RF Remote Control: Included is an RF remote that allows you to freely operate the DISH Wally receiver up to 200' away, even through walls and obstructions. Never lose your remote again with the new Remote Finder feature; a chime guides you to the remote's hidden location. Simple Setup: The KING Tailgater portable satellite antenna automatically locates and points to DISH satellites so you don't have to worry about pointing an antenna. You simply need to pick your state using the DISH Wally receiver's remote and on-screen menu to start watching DISH programming outdoors. 50' Coax Cable: The KING Tailgater portable antenna connects to the DISH Wally satellite receiver using the included 50' RG-6 coax cable. Power Requirements: The KING Tailgater portable satellite antenna draws power from the included DISH Wally HD satellite receiver through the coax cable. The receiver will require a 110VAC power source, and draws about 50 watts. You will need a power inverter to run all of your equipment from your vehicle's DC power supply (110VAC power outlet required). If your TV is rated greater than 100 watts, it may require direct connection to the vehicle battery. If you are watching TV from your vehicle for more than a few hours, periodically run your vehicle to maintain battery life. For extended use, a portable power generator, power pack or alternative accessory battery is recommended. Note: Starting your vehicle may temporarily shut off power and require a quick rescan for DISH satellites. 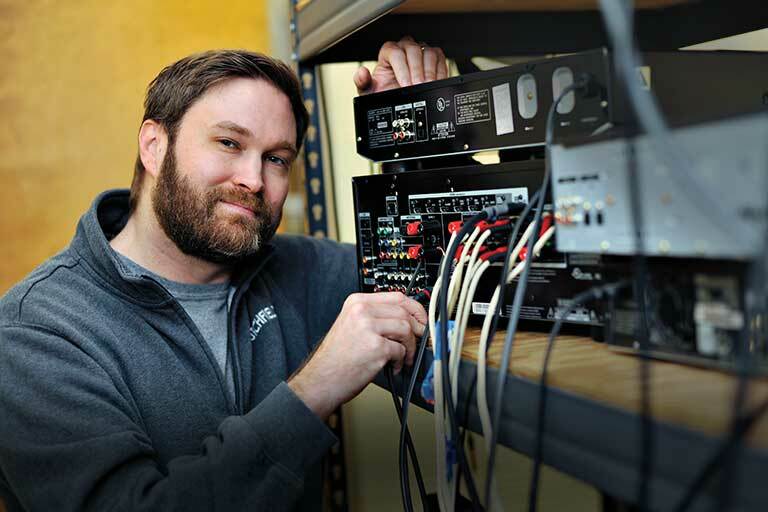 DISH Outdoor Support: DISH Outdoors sales agents are specifically trained on all outdoor TV equipment and are available to assist you 24 hours a day, seven days a week at 1-800-970-9021. Click here for more information about DISH outdoor support services. Searches related to the King Tailgater Controls VQ4550 Receiver and portable DISH satellite antenna bundle.